A good infographic is easy to read and comprehend without taking a lot of time. I love the one featured below regarding the 10 Dental Internet Marketing Strategies that produced results. After reviewing it in-depth, I am quite happy to say that we incorporate all of them for our dental – and non-dental – clients! The following notes on the infographic is my take-away of the most important elements that require the immediate attention of any dental practice. A Website That Converts – Your dental website can be the prettiest one out there, but that holds little value if nobody is filling out the online form or picking up the phone to schedule an appointment. What matters to us is that your website is directing people to your practice. If you are not seeing traffic from your website, it might be time for a makeover. Local and Regular SEO – Instead of using a “shotgun” approach, we direct our clients toward systematic and local Search Engine Optimization efforts that produce results. Google Authorship – Recently implement by Google+, we have incorporated Google Authorship into our training and for our clients. Google Adwords The Right Way – Adwords is awesome, but only if it’s set up correctly. Our highly-trained staff members specialize in Google Adwords campaigns that get results. Social Media and Retargeting – Strategies that make the most of these ever-changing marketing avenues can help keep your business top-of-mind, especially in your customers’ Facebook or Twitter Feeds. Building Your Reputation – Many potential patients will not read the content on your website. This content is largely for search engines. However, they WILL read reviews and testimonials from patients who have visited your office and experienced treatment by you and your staff. 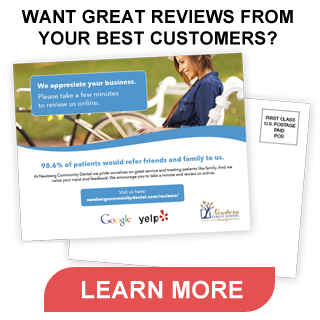 Take advantage of the opportunities you have with current patients to get a good review and then give that review to us to put on your website. This small investment in your practice will reap big rewards.